This article is about the plant. For the pencil game, see Sprouts (game) § Brussels. The leafy green vegetables are typically 1.5–4.0 cm (0.6–1.6 in) in diameter and look like miniature cabbages. The Brussels sprout has long been popular in Brussels, Belgium, and may have gained its name there. Although native to the Mediterranean region with other cabbage species, Brussels sprouts first appeared in northern Europe during the fifth century, later being cultivated in the 13th century near Brussels, from which they derived their name. They may also be called brussels sprouts, Brussel sprouts, or brussel sprouts. Brussels sprouts grow in temperature ranges of 7–24 °C (45–75 °F), with highest yields at 15–18 °C (59–64 °F). Fields are ready for harvest 90 to 180 days after planting. The edible sprouts grow like buds in helical patterns along the side of long, thick stalks of about 60 to 120 cm (24 to 47 in) in height, maturing over several weeks from the lower to the upper part of the stalk. Sprouts may be picked by hand into baskets, in which case several harvests are made of five to 15 sprouts at a time, or by cutting the entire stalk at once for processing, or by mechanical harvester, depending on variety. Each stalk can produce 1.1 to 1.4 kg (2.4 to 3.1 lb), although the commercial yield is about 900 g (2.0 lb) per stalk. Harvest season in temperate zones of the northern latitudes is September to March, making Brussels sprouts a traditional winter-stock vegetable. In the home garden, harvest can be delayed as quality does not suffer from freezing. Sprouts are considered to be sweetest after a frost. Brussels sprouts are a cultivar group of the same species as broccoli, cabbage, collard greens, kale, and kohlrabi; they are cruciferous (they belong to the Brassicaceae family; old name Cruciferae). Many cultivars are available; some are purple in color, such as 'Ruby Crunch' or 'Red Bull'. The purple varieties are hybrids between purple cabbage and regular green Brussels sprouts developed by a Dutch botanist in the 1940s, yielding a variety with some of the red cabbage's purple colors and greater sweetness. Most U.S. production is in California, with a smaller percentage of the crop grown in Skagit Valley, Washington, where cool springs, mild summers, and rich soil abounds, and to a lesser degree on Long Island, New York. Total U.S. production is around 32,000 tons, with a value of $27 million. About 80 to 85% of U.S. production is for the frozen food market, with the remainder for fresh consumption. Once harvested, sprouts last 3-5 weeks under ideal near-freezing conditions before wilting and discoloring, and about half as long at refrigerator temperature. U.S. varieties are generally 2.5–5 cm (0.98–1.97 in) in diameter. The most common method of preparing Brussels sprouts for cooking begins with cutting the buds off the stalk. Any surplus stem is cut away, and any loose surface leaves are peeled and discarded. Once cut and cleaned, the buds are typically cooked by boiling, steaming, stir frying, grilling, slow cooking, or roasting. To ensure even cooking throughout, buds of a similar size are usually chosen. Some cooks make a single cut or a cross in the center of the stem to aid the penetration of heat. Overcooking renders the buds gray and soft, and they then develop a strong flavor and odor that some dislike for its garlic- or onion-odor properties. The odor is associated with the glucosinolate sinigrin, a sulfur compound having characteristic pungency. For taste, roasting Brussels sprouts is a common way to cook them to enhance flavor. Common toppings or additions for Brussels sprouts include Parmesan cheese and butter, balsamic vinegar, brown sugar, chestnuts, or pepper. 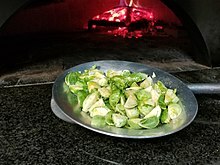 Another way of cooking Brussels sprouts is to sauté them. Brussels sprouts can be pickled as an alternative to cooking them. ^ a b Oliver, Lynne (2011-04-11). "Food Timeline: Brussels sprouts". Retrieved 2012-04-09. ^ a b c d e f g h "Brussel Sprouts". University of Georgia College of Agricultural and Environmental Sciences. Archived from the original on September 13, 2007. Retrieved 2007-09-21. 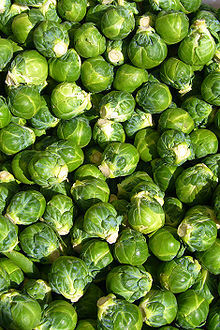 ^ "Brussels sprout". Grammarist. 2014. Retrieved 8 June 2017. ^ Crockett, James Underwood (1977). Crockett's Victory Garden. Boston: Little, Brown and Company. p. 187. ISBN 0-316-16120-9. ^ Rose, Linda (2017). "Brussels sprouts". University of California, Master Gardener Program of Sonoma County. Retrieved 7 June 2017. ^ Friesema, Felicia (8 February 2013). "What's In Season at the Farmers Market: (The End of) Purple Brussels Sprouts at Weiser Family Farms". L. A. Weekly. Retrieved 19 November 2017. ^ Illert, S. (2004). "The Small Market Study: Brussels Sprouts". Gemuse Munchen. 40 (12): 56–58. ^ a b Zeldes, Leah A (2011-03-09). "Eat this! Brussels sprouts, baby cabbages for St. Patrick's Day". Dining Chicago. Chicago's Restaurant & Entertainment Guide, Inc. Retrieved 2011-06-30. ^ a b "Crop Profile for Brussels Sprouts in California". ipmcenters.org. United States Department of Agriculture. Archived from the original on 2008-02-22. Retrieved 2007-09-21. ^ "Research Says Boiling Broccoli Ruins Its Anti Cancer Properties" (Press release). University of Warwick. 15 May 2007. ^ Pettit, Stephen J; Japp, Alan G; Gardner, Roy S (10 December 2012). "The hazards of brussels sprouts consumption at Christmas". The Medical Journal of Australia. 197 (11): 661–662. doi:10.5694/mja12.11304. ^ a b c Ortner, E.; Granvogl, M. (2018). "Thermally induced generation of desirable aroma-active compounds from the glucosinolate sinigrin". Journal of Agricultural and Food Chemistry. 66 (10): 2485–2490. doi:10.1021/acs.jafc.7b01039. PMID 28629219. ^ "Abernethy Elementary chef taking her lessons to White House". The Oregonian. 2010-06-01. Wikimedia Commons has media related to Brassica oleracea var. gemmifera.